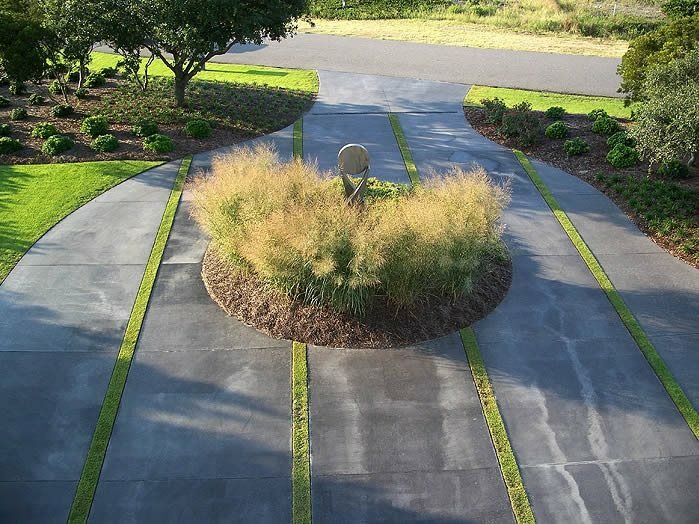 This exposed aggregate driveway features contrasting concrete borders and bands. Huettl Landscape Architecture in Walnut Creek, CA. Four thin grass strips accent this stained concrete driveway. Classic Landscapes in Wilmington, NC. 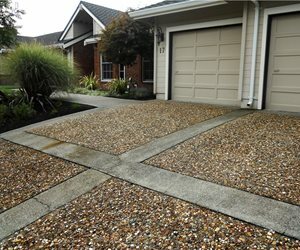 Many people want a decorative driveway, but can't afford to pave the whole thing in pavers or cobblestones. An affordable option is to accent your driveway with decorative borders, bands and an apron. The bulk of the driveway can then be paved in a more cost-effective material such as gravel, asphalt or concrete. These driveway accents can be made with flagstone, cobblestone, brick, pavers, stamped concrete, landscape timbers, or even grass or ground cover. A driveway apron is the entry point where the driveway widens to meet the road. The apron typically extends 15 to 20 feet from the beginning of the driveway. Using a contrasting material for the apron lends a nice touch to the overall feel of the driveway by providing a sophisticated transition from the street. For gravel drives, it is common to see pavers or cobblestones used as an apron, while for concrete drives brick is a popular apron material. For a driveway made completely of pavers you can change the paving pattern or color to designate the apron. A circular, sunburst or compass design can also be created in the center of the apron for added style. Driveway borders can be functional and decorative. 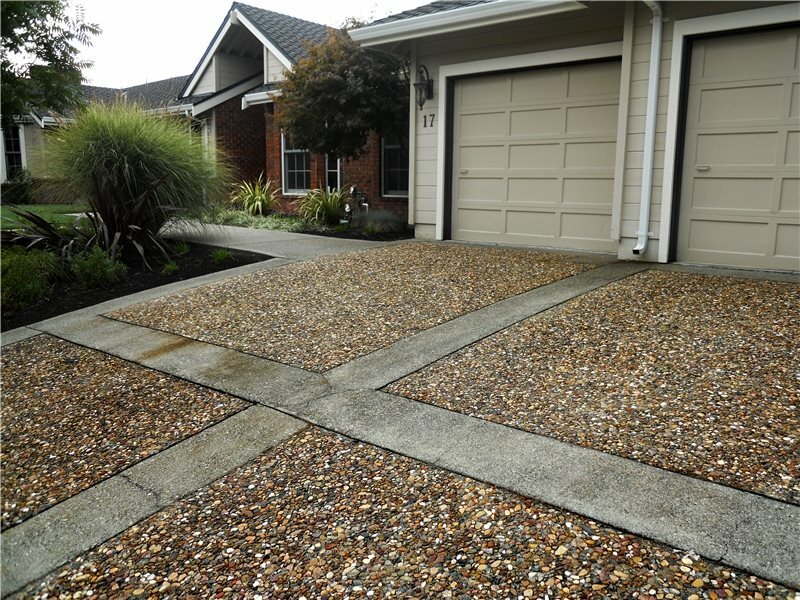 For a gravel driveway, borders serve to contain the material as well as add a decorative touch. Borders can be made of pavers, bricks, cobblestones, or even poured concrete that is stamped and colored. For concrete or asphalt driveways, borders are intended more for decorative purposes. Pro Tip: Add 1-2 foot wide borders along driveway sides to improve walk-about space. Borders add decoration and can be made of concrete, colored concrete, brick, pavers or stone. Think of these borders as a decorative frame around the driveway. I will often cut in a band at the top and bottom of the drive to match the new side borders. Finally, decorative bands can be added to your driveway. Frequently these bands run across the width of the driveway at even intervals. However, you can get more creative if you like by opting for bands that run lengthwise, or even intersect to form a grid pattern. Bands that run lengthwise are often referred to as driveway ribbons or strips. Bands and borders look best when in a contrasting color to the rest of the driveway. So if your driveway is plain concrete pick a paver with a deep color that will stand out against the concrete. In the past few years it has become very popular to use bands or strips of grass or ground cover as part of a driveway design.